New Ashampoo WinOptimizer 2019 revealed to public and now available for download with free license key. Every found new release, there is two version of Ashampoo WinOptimizer released to public. The version labeled with year is fully free but still requires a license key to activate. Everyone can download Ashampoo WinOptimizer 2019 with free license key by creating an account on Ashampoo (free). Ashampoo WinOptimizer 2019 features with elegant interface. Its a powerful utilities to clean, tweak, tune and optimize PC just in a few easy click. This version Ashampoo WinOtimizer still provides easy-to-use interface for computer optimizing and maintaining. And also support 32bit and 64 bit Windows version supported. To get free license code for this software is easy. Just download or use the following registration links. 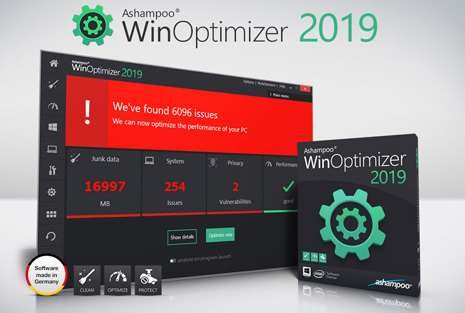 Registration Link for Ashampoo WinOptimizer 2019: Click to register! The tutorial to get the activation code, read the following steps. You must have an Ashampoo Account to get the software. Download the software and install it in your PC. Click free license request button or use registration link above to open the registration page to get free license. Follow the instructions until you are receive a license code. You can skip the free account creation if already have an shampoo account. After entered the password you’ll receive the serial key instantly. The Ashampoo WinOptimizer 2019 license key also will be sent to your email. I love the new elegant interface on this version. It better than previous version. The latest version. If you need system optimizer from Ashampoo that better than WinOptimier 2019 try Ashampoo Winoptimizer 16 with some extra premium features.